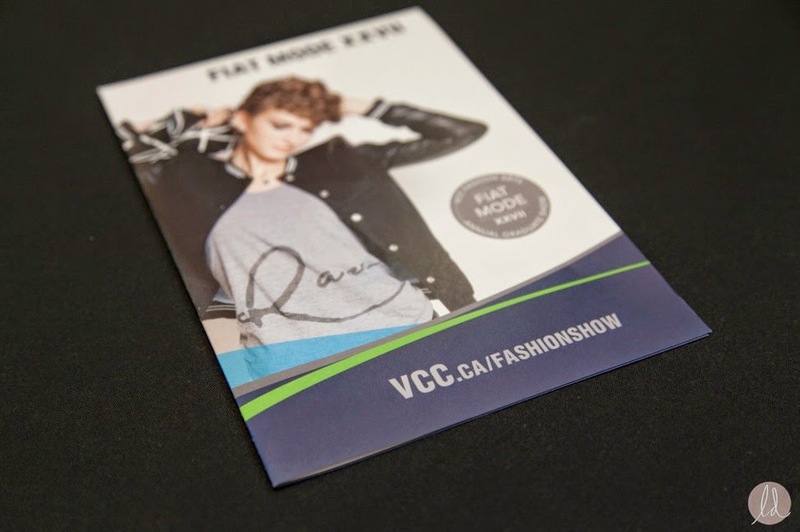 I have been attending the Vancouver Community College (VCC) Fiat Mode grad fashion show every year since 2007 and was privileged to feature a few of their talented students each season in my former magazine - a tradition I now continue on this website. Attending student grad shows has always been my number one priority as mentoring rising talent is both a privilege and a responsibility I embrace fully. It's exciting to see the creativity brought by these young artists and I enter each show full of anticipation. Previous year's shows have been held in a variety of locations - Performance Works on Granville Island, Rocky Mountaineer Station and the Italian Cultural Centre - but a few years ago moved into their open atrium at the school's Broadway campus. There is a portfolio room on the left as you enter on the ground floor (I highly recommend stopping in and having a look) and then up an escalator the open atrium is fitted out with an L-shaped runway space lined with chairs. I love the more intimate setting. On entry, the audience was plied with sparkling beverages and decadent cupcakes. This pre-show time was also perfect for connecting with others in attendance whether long-time friends or new acquaintances. Then it's quickly time to take our seats. Five raised platforms were placed evenly along the open runway allowing each of the 5 looks students create to be shown off to full advantage. The models rotate through all platforms so the audience gets a chance to enjoy a good view of every look. As a former costume designer, I personally love the fact this type of show puts me up close and personal with the garments. The fabrics, the construction, any extra detailing and the quality of the tailoring are all close enough to critically evaluate. Didn't get that seam flat? Left a loose thread hanging? Every finished detail stands out, so the students are pushed to be their best. First on the runway this evening were three designers from VCC selected as finalists in the Canada's Breakthrough Designers Competition 2014 sponsored by Telio Fabics. This year's theme was TEXTURES - "Man is an onion made up of a hundred integuments, a texture made up of many threads. "― Hermann Hesse - so the palette of fabrics only included white and black so the textures of the fabrics and how the designer used them would be what the judges focused on. Next came a great variety of collections that ranged from day wear to evening wear, from funky to elegant and from theatrical costuming to cosplay style unitards.The eleven graduating designers all showcased strong skills and individuality. I have to admit I craved the black/white blocked skinny pants by Jessica Ram seen in the image below - I love wearing that silhouette with a great jacket or longer top - but there were many standout pieces. Each collection received an appreciative response from the audience and the range of talent showcased this evening bodes well for the Vancouver fashion scene. It was also exciting to see 4 of these student step on the runway again in November at Vancouver Alternative Fashion Week (VALT) - Mikiki Katahari, Marjan Rabbani, Nicole Fromm (Loop D Loo) and Samantha Stroman. Weren't able to make this show? Novus TV was onsite filming and offered up this video on Youtube. It includes not only runway, but several interviews that take you behind the scenes. A great way to relive the moment as well for those of us that want a second look. Kudos to the great team who pulled this wonderful evening together - Producers Nancy Nesbitt and Sarah Murray, VCC Hair, Make-up Artistry and Skin & Body Therapy (Nails) students who created the models look, MC Anika Yuzak and the Fashion Arts Faculty. And of course no evening like this can run without great sponsors. Special thanks to Telio, Novus TV, Lucky Babe, Mason Sewing Machines and Jarislowsky Fraser Limited.